History was made in Somalia when the first football match in the country’s history has been watched live on Thursday. The military club [Horseed] won the General Da’ud Cup final match after beating their rivals, the Somali police-owned club of Heegan 2-1. Thursday’s match is recorded as the most watched Somali football game in history as millions of Somalis in and outside the country were watching it on TV, while tens of thousands turned up for the match at stadium Banadir. Both teams were fully prepared for the match which local media voted as ‘the most hotly-contested’ football game in Somalia ever. The police club [Heegan] who are the current champions of the country scored the lone goal in the 32nd minute of the match when Deeq Abdullahi Nur AKA Aariyo, placed a beautiful shoot into the opponents’ goal, ending the first half 1-0 in favor of Heegan FC. Horseed stepped up their attacks to compensate for the goal, but one of their playmakers, Robert Kareithi Meme [Kenya] was awarded with a red car in the 34th minute. However, that didn’t stop his side from moving on, as Adaani Barre Isse, did score the equalizing goal for his team in the 49th minute. Daniel Matengo [Kenya] scored the winning goal for his team in the 60th minute of the match. Heegan didn’t despair of trying to equalize, but they lost several opportunities which could have made them at least a goal. The 2-1 victory for Horseed was already predicted by football journalist Mohamed Barre. “My prediction of the final match result is that Horseed will win 2-1” the Minneapolis-based journalist said on Tuesday. Somali minister for youth and sport, Mohamed Abdullahi, described the first televised football match in the country as a ‘big step’ forward. “Today I am more than happy. The first live match in Somalia shows we are moving forward” the minister for youth and sport Mohamed Abdullahi said while talking to the media at the stadium after the end of the first half. “I praise the Somali Football Federation authorities for their professional organization. Football is playing a big role in the country’s development, peace building and income generation” the minister said while standing alongside the president of Somali Football Federation, Abdiqani Said Arab. The president said that the live coverage was a test that his federation can televise a match saying it went on successfully. “This was a starting point and we have understood that we can put live matches on air. I know it is a hard work which needs much money, but we are committed to continuing it” the president said. “In the months to come, we will at least try to have some of the hottest matches televised and I am sure we will finally approach our target which is to get every Somalia match screened live” said president Abdiqani Said Arab. Somalia has realized this major approach and other developments made in the country, as the young age president has only been in the leadership officer for less than 14 months. Somali parliament member, Mustafa Sheikh Ali Dhuhulow, who was one of several government officials at the stadium, told the media that football is now making Somalia recover from past wounds. 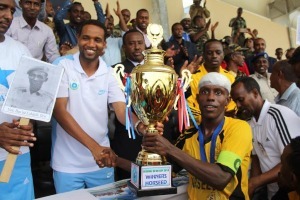 “A window of progress and public integration has been opened by the Somali Football Federation. This is an encouraging move” the law maker said. “I am a fan for Heegan, but I don’t mind if we have been defeated. It is a football, so you can win or lose” added Mr. Dhuhulow who is one of the most football-bad government officials. 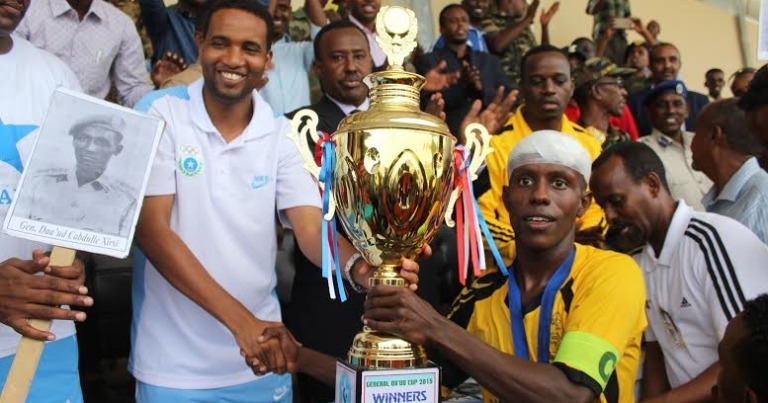 However, apart from the trophy, the winners were awarded with 45 million Somali shillings as prize money, while Heegan FC received 25 million Somali shillings for the second place.